Eugenie is my favourite - she's a subtle dusty blue, which matches the colour of my wise old gardening eyes. 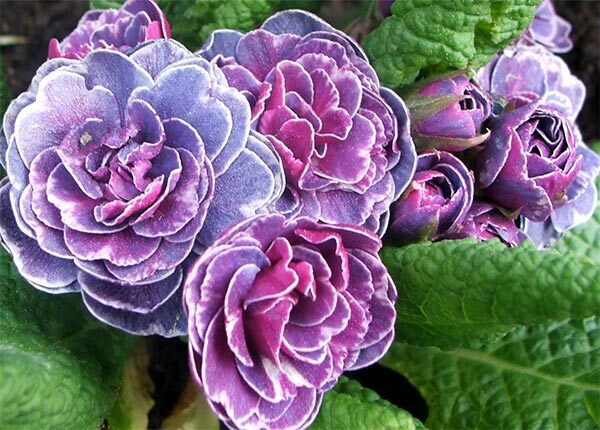 To demonstrate this wisdom I'll move the plants after flowering, when the hotter summer days start - primroses prefer cooler, partly shaded places. My plant label, lovingly filed in the Moosey office, tells me that the flowers are double and are able to withstand harsher conditions than the common single-flowered varieties. I'm thrilled with the delicacy of the flowers, so much so that I've returned to the nursery for more. Ha! But there's more! My research, as a responsible disseminator of gardening information, delivers me to their website. Barnhaven Primroses have been suppliers of hand-pollinated primula seed since 1935. And their nursery is in Brittany, France. Oops.